The Serengeti National park in Tanzania really needs no explanation, as it is probably the most famous place to see wildlife in Africa. At this point you may have noticed that we've somehow become safari aficionados, so I feel comfortable comparing it to places like Etosha in Namibia, the Okavango Delta and Chobe in Botswana and South Luangwa in Zambia. We still have a few more we will be seeing including the Masai Mara Reserve in Kenya and Queen Elizabeth National Park in Uganda. After the parks we've seen so far, I can see why this place has become so famous. Hands down, we saw more wildlife here than anywhere else. Of course that comes with a price, along with the abundance of animals comes an abundance of people. The other places definitely excel in a more intimate experience with the surroundings, which cannot be discounted. If someone asked us which is the best place to view animals that would be a tough question to answer. Every park or reserve has their own personality that I have become very attached to. My answer is go to as many national parks and game reserves as you can! Nothing beats seeing animals where they're supposed to be. Sorry, that was a long winded intro to our 3 part series of the Serengeti National Park. Since we have so many photos we wanted to share, we thought we'd mix things up and just give you captions or brief stories per photo over the next 3 posts. Enjoy. 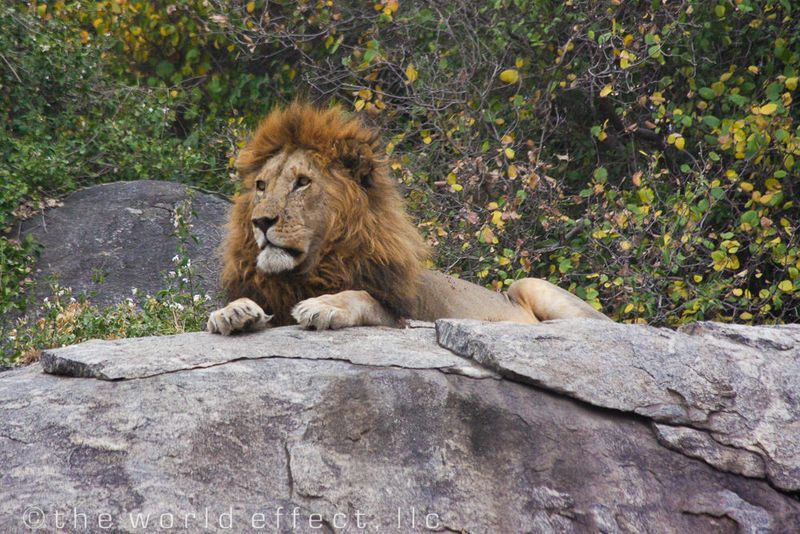 This lion on sitting on the rock was the first animal we saw in the Serengeti. You can't see it in this photo, but this rock is at least 12 feet off the ground over looking the plains. It was another "straight out of The Lion King" experience. This was the second thing we saw. 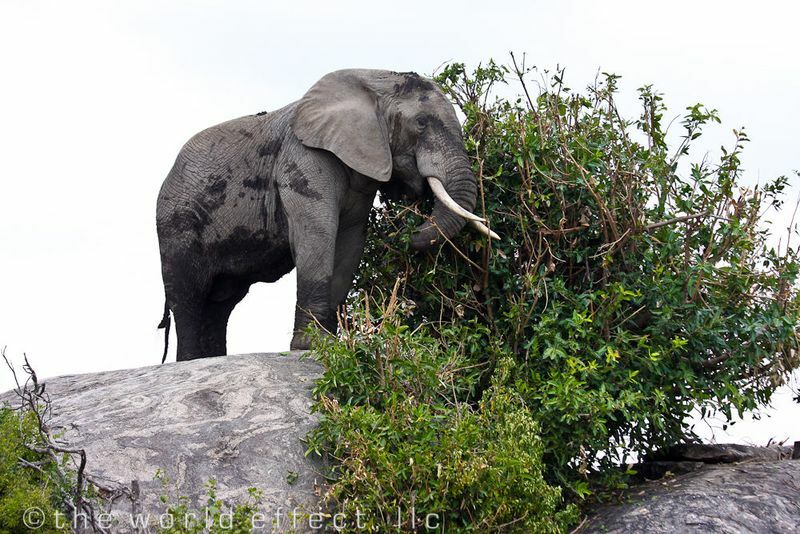 This elephant perched on a rock was only about 100 yards away from the lion. 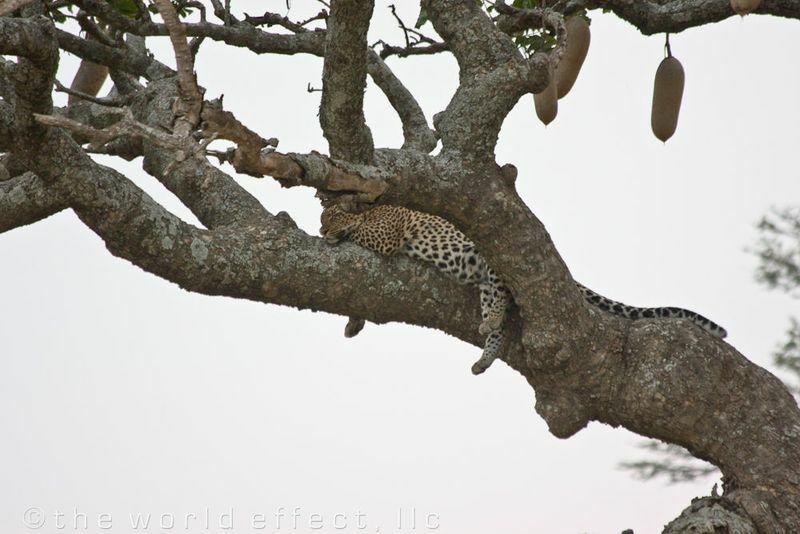 The leopard is by far the hardest animal of the "Big Five" to spot. A guide told us that is why they put the leopard on the 100 South African Rand note, it's rare. We got lucky finding this one sleeping in a tree. This was crazy. We spotted a pride of lions laying around in the grass just before sunset. Then we saw two elephants fighting beyond them. Eventually, one elephant began to chase the other straight towards the lions we were watching. The charging elephants almost trampled the pride of lions forcing them to flee right in front of our Land Cruiser. 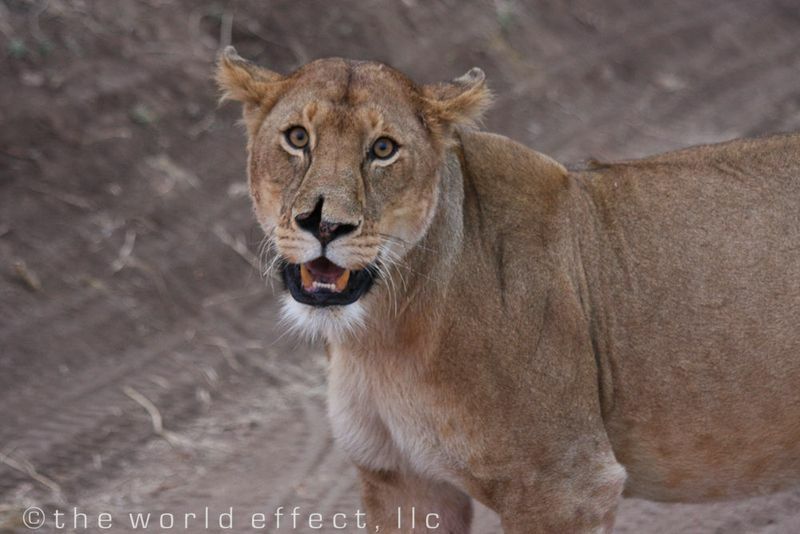 This is a photo of one of the Lionesses. She is obviously no stranger to a good fight. As I took this shot and several more of other lions, directly behind us the elephants were running directly into an absolutely beautiful sunset. I had photography overload, a photo Nirvana. Everywhere I looked was a great photo opportunity. 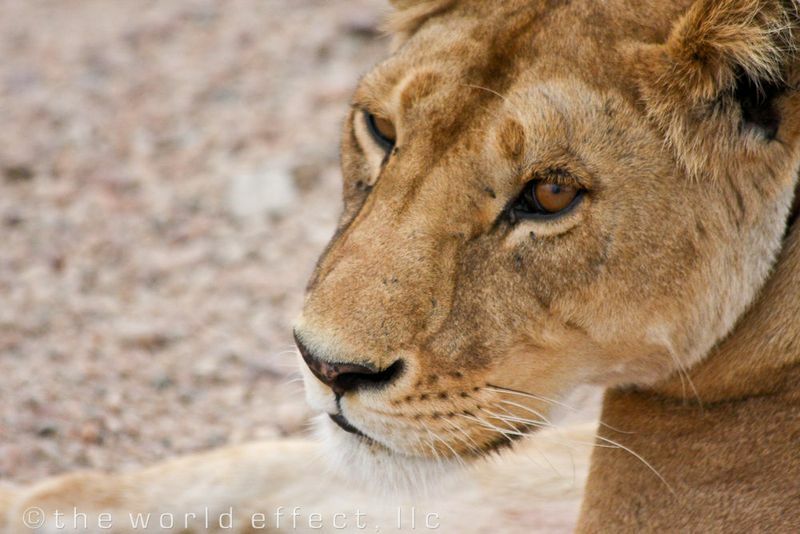 Here is the photo 180 degrees from the lion above. This is actually the elephant being chased, trying to double back towards us to loose their pursuer. They eventually continued across the river out of our sight. I’d like to take my two kids aged 6 and 8 on safari. Would the safari you took to the Serengeti be comfortable and safe for such young kids? These are the best safari photos yet. Can’t wait to see the next 2 instalments of the Serengeti. Teh African safari is one of those travel cliches, but it is cliche because everyone seems to have an amazing time. Your experience seems no different. These photos are amazing! (I’ve been following your blog for a couple of weeks now but it’s my first time commenting.) 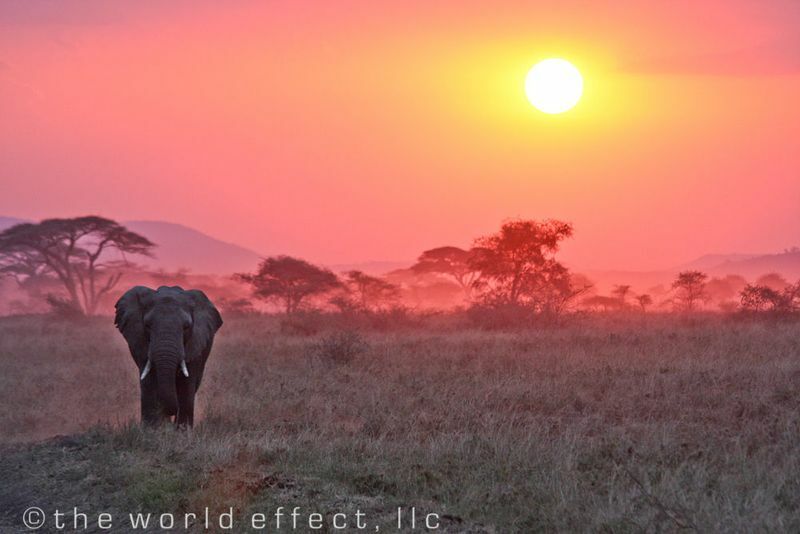 I hope I will be able to safari in the Serengeti one day! I can’t wait to see the other photos! Absolutely. In fact, we saw a group of Dutch families there. Each family had kids ranging from about 4 or 5 and up. I’m not sure which tour operator they were with, but it looked like they were have a great time. There are many different levels of accommodations and tours in the Serengeti. I would recommend looking for a family friendly tour operator there, I know they’re out there. This would definitely a place you and your kids would never forget. I just discovered this website through Twobackpacker’s website. The pictures is what makes this site truly amazing, been looking around for last 30 minute and still so much to see! And i will keep up with you two and fallow you around. I am going to go tweet you, cya! hehe, you need to take care of that php ! Thanks Frank. We just looked at your site, it’s very nice! We’ll be sure to follow you on Twitter as well. Sorry what’s php? The Serengeti national park is the largest park in Africa and offers some of the best wildlife experience you can ever have.It is home to some of the most dangerous carnivorous animals and the migration of wildebeest and zebras is an amazing sight.No wonder it is declared as the World Heritage Centre by UNESCO.